HISTORY OF THE WORLD IN 75 MINUTES. Comically channeling the demise of great world empires, Colin Quinn uses his "articulate brand of comedy" in taking audiences through an uproarious history of the world in 75 minutes. From his personification of Caesar as the original Italian mobster to his complaints about Ancient Greece and Antigone giving way to Costco and Snooki, Quinn is at his satirical best, taking on the attitudes, appetites and bad habits that toppled the world's most powerful nations. 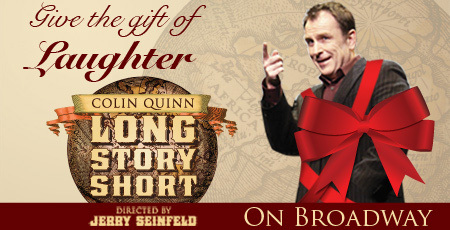 Colin Quinn Long Story Short proves that throughout human history, the joke has always been on us. *This offer is valid through 1/8/11 and is subject to availability. Not valid on prior purchase. Offer cannot be combined with other discounts of promotions; blackout dates and restrictions may apply. Limit eight (8) tickets per order. No refunds or exchanges. Offer may be revoked at any time. All discounts include 1.50 facility fee.